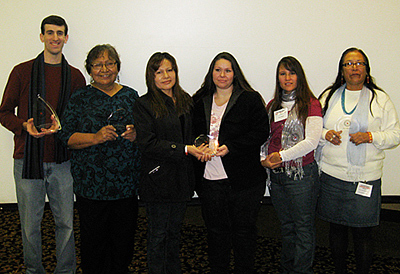 LLC returned to Tusweca Tiospaye’s annual language summit in Rapid City, SD, November 18-20 2010. We were proud to have literature on display for LLEAP and a monitor playing Berenstain Bears. Jessie Nelson set up audio dubbing software for a special presentation on November 19th, to demonstrate how the Project Team recorded for the Berenstain Bears project. Children at the presentation got to hear their own speaking of Lakota dubbed into the mouths of the cartoon Bear family. Some of the featured tall's included: LLC Vice-Chairman Ben Black Bear gave two talks on coining new words in Lakota for modern usage. Former LLC Education Coordinator Karen Little Wounded spoke to attendees on Lakota Language Assessment testing. Kim Campbell, gave a talk about what makes a Lakota language teacher a “highly qualified” professional. LLC Linguistic Director Jan Ullrich gave three talks, ranging from the status of the Online New Lakota Dictionary and overall thoughts on language revitalization, to a look at the impact of English on the use and evolution of the Lakota language. LLC is proud to be part of this annual Language Summit, and we look forward to being back in Rapid City next year. LLC’s long-planned documentary film project, Rising Voices/ Hótȟaŋiŋpi, now has a highly respected production company involved in the effort Florentine Films/Hott Productions Inc. The Lawrence Hott has thirty years of experience crafting award-winning films and series for PBS and international distribution. His enthusiasm and expertise give us confidence that Rising Voices will be completed and delivered to a far-reaching audience. Last year saw the beginning of work on LLC’s documentary film project, Rising Voices, which will focus in-part on Lakota families rebuilding the language as a part of their daily lives, while also looking at Native language revitalization around the country. A grant from the Dakota Indian Foundation allowed us to work with Makoche Studios in Bismarck to shoot footage around and create a five-minute preliminary proof-of concept film. The documentary project is still seeking Lakota families to participate in filming. We are looking for families (or other intergenerational caregiver-mentor arrangements) who are putting commitment and effort into recovering the language for their own daily and social use. Please contact LLC by e-mail if you are or know of such a family. We are happy to announce that after years of work we have finally launched an online lemmatizer for the Lakota language. This tool enables instant look-up of words in texts in the New Lakota Dictionary’s online home at www.lakotadictionary.org/forums, and supports a spellchecker. The site also has a new version of the Lakota-orthography keyboard for beta-testing the NLD’s search and translation chops. Since Lakota is an agglutinating language (meaning it combines words and parts of words to create new words), LLC had to develop a unique computer algorithm to handle the potential combinations, which is the lemmatizer. It’s free to register to use the online NLD. The Lakota Language Learning Community is closing in on 2,700 members worldwide. The arrival of the Speak Lakota! Level 3 Textbook means that other new products are also now available. The first part of the Level 3 Teacher’s Guide is now available for free download. The final Teacher’s Guide is ten Units will be available from the products website when it is complete. 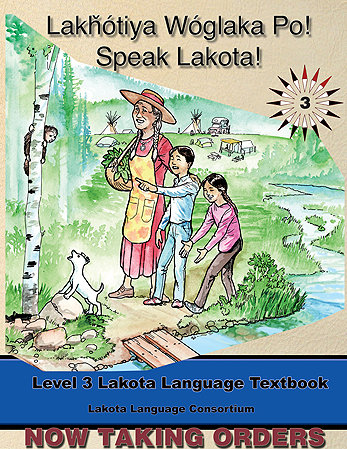 Finally, the 2nd edition reprint of the New Lakota Dictionary is just around the corner so please be patient! You can email us with you contact information and we will put you on a contact list. We currently expect the books to arrive in April. Order at the LLC Bookstore. LLC is proud to announce a major turning point in Lakota language education. 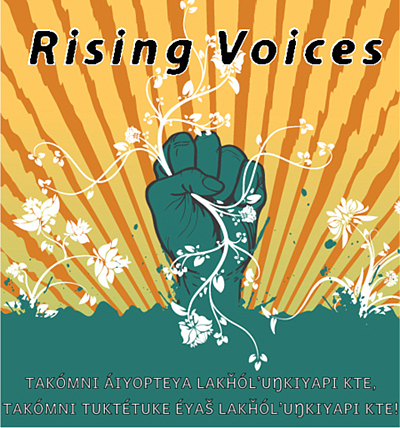 In October, the Lakota Language Education Action Program (LLEAP) received two grants from the U.S. Department of Education, funding two new undergraduate degree programs in Lakota Language Teaching and Learning – one at Sitting Bull College Education Department(Standing Rock, Fort Yates, ND), and the other at the University of South Dakota School of Education (Vermillion, SD). These grants provide $2.4 million in funding to create 30 new Lakota language teachers by 2014, whose training complies with new State certification standards for Lakota language teachers. 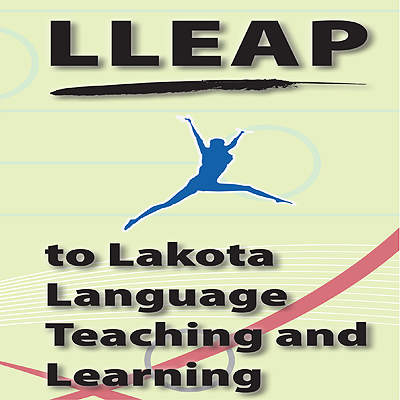 LLEAP also creates two new college-level Lakota language instructor positions. LLEAP’s two-year curriculum lets Education students major in Lakota Language Teaching and Learning, with a commitment to enter the Tribal schools as Lakota language teachers. LLEAP marks the first time a Native American professional development program has focused on Native language education as a career path. This Federal recognition of Lakota’s importance as a North American language for a significant population (120,000 potential speakers and growing) shows a remarkable break with the past, and bodes well for all Lakota language activism in the future. As fluent Elder speakers retire and pass on, there is a crisis-level need for fluent Lakota language teachers who can continue the work of reviving the language. LLEAP provides intensive Lakota language study and practice, increasing students’ proficiency and fluency; and it establishes high-quality education in teaching techniques, so that newly-fluent students can return to their communities able to teach in immersion programs as well as in classrooms. LLEAP students will have already completed the first two years of work towards an Education degree. LLEAP will exist for four years, so students entering college in 2010 or 2011 can apply for LLEAP in their junior year and get a full-ride scholarship for their final two years at college, supported by the U.S Department of Education grants. After LLEAP’s four-year grant period, LLEAP will dissolve and Lakota Language Teaching and Learning will become a regular undergraduate Education degree major at both Sitting Bull and USD. Current Education degree students who are passionate about learning Lakota are needed to apply for this new major now – the first LLEAP classes start in January 2011. LLC will be at the Lakota-Dakota-Nakota Language Summit in Rapid City, SD from November 18-20, with information about enrolling in LLEAP. Visit the LLEAP website at www.lleap.org. 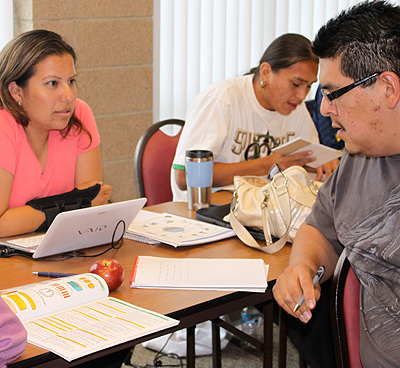 The 2010 Lakota Summer Institute has ended, with the highest attendance numbers we have seen yet. Sixty teachers and adult learners came to Sitting Bull College at Standing Rock during June, for three weeks of intensive Lakota language study. LLC introduced a new textbook, and a new Second Language trainer, at this lively and fruitful gathering. Most of our LSI students teach at schools in Rosebud, Pine Ridge, Cheyenne River-Eagle Butte, and Standing Rock. But this year we learned that Lakota language teachers are not just in the Northern Plains! 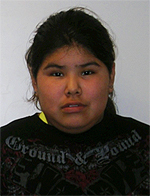 Two new students came from the Native American Community Academy in Albuquerque, New Mexico. Junior Garcia and Anpao Duta Flying Earth proved to be bright young teachers. Nor is LSI only for language teachers. Petra Reyna is a Standing Rock member who teaches biology at Standing Rock High School. After extensive university education, Petra returned to her hometown of Fort Yates with the intention to become a fluent Lakota speaker, and now she values learning alongside her children as they do their Lakota language homework. LSI could not occur – especially this year – without the dedicated support work of Sunshine Carlow of Fort Yates, and her assistants, Nacole and Danielle. Thanks must also go to SRST and Sitting Bull College for their consistent support of the LSI. Next year, 20 episodes of the Berenstain Bears animated cartoon series will be broadcast on South Dakota Public Television, with all dialogue dubbed in Lakota. A DVD will be released as well, complete with a Teachers’ Guide . 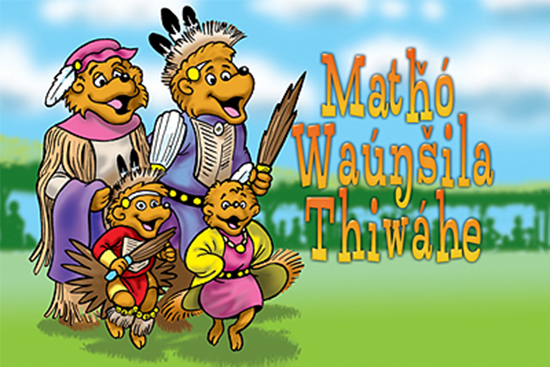 This LLC project was initiated last year as part of its mission to promote the language outside of the schools -- and what better way to introduce spoken Lakota to the wider public, than to bring it into living rooms out of the mouths of cartoon bears? 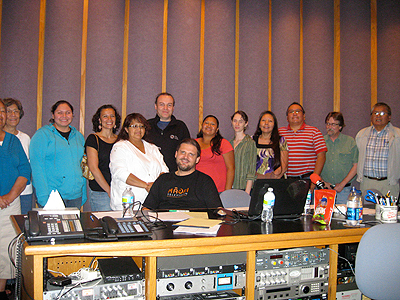 Thirteen Lakota speakers spent two weeks in July at Makoche Recording Studio in Bismarck, ND, and will return periodically during the fall, recording the adventures of Mama, Papa, Brother, Sister, Gramps and Gran, who live in a tree house out in Bear Country. Through these speakers, who hail from all of the Lakota lands, Lakota comes alive in everyday situations: in the Bears’ kitchen, backyard, garage, and playground. The goal of the project is to broadcast the Lakota version across South Dakota, stream from the SDPB website, and distribute DVDs of the programs to schools and reservation communities. The impact of this series in Lakota in this region will be powerful. Children who have never heard Lakota spoken around the dinner table can see it happen when the Bears sit down for a meal. Each episode is 12-minutes in length. LLC Board Member Ben Black Bear plays Papa Bear, who is an expert in everything and never doubts himself, even when he’s wrong. Dainna Red Owl is wise and patient Mama Bear; Naomi Last Horse is Brother Bear, and Bernadine Little Thunder plays Sister Bear. Gramps is voiced by Dakota-speaker George Fool Bear. Other voices come from Ken Little Thunder, Manny Iron Hawk, Peter Hill, Sandra Black Bear, Paulette High Elk, and others. The DVD and Teachers’ Guide will be released in Summer 2011, and the episodes will be broadcast on South Dakota Public Television in Fall 2011. The episodes were originally part of the Berenstain Bears cartoon series broadcast nationally on PBS in 2003. It is still shown on various PBS stations around the U.S. and Canada, and PBS has an interactive learning web site built around the Bears. Standing Rock Sioux Tribe is the co-producer of this project, and as ever, we are grateful for their support. LLC also sends thanks to Berenstain Enterprises for waiving all licensing fees. This groundbreaking Lakota language educational program would not have been possible without their generosity . Take a look at KX News' story on the "Berenstain Bears" project. 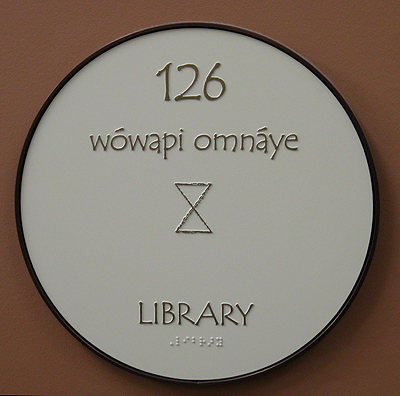 The new Standing Rock Elementary School will open for the 2010-11 school year with bilingual signage in Lakota and English, courtesy of LLC’s “coining committee,” which includes Board Members Ben Black Bear and Kevin Locke, plus Linguistic Director Jan Ullrich, Executive Director Wil Meya, and Board Member David Rood. The Standing Rock Education Department asked LLC for Lakota translations of room designations like “Main Office,” “Nurse,” “Gymnasium,”, “Cafeteria,” “Library,” “Faculty Lounge,” and so forth. In June, the LSI students and faculty took a tour of the recently-finished school at Fort Yates. Our photo tour of the bilingual building shows the state-of-the-art construction as well as the handsome signage. At the intersection of the two main hallways, the “heart” of the building, artwork on the floor spells out four of the Ten Lakota Virtues in brass letters: wačháŋtognake (generosity), wóksape (wisdom), wóohitike (courage), and wówačhiŋtȟaŋka (fortitude). 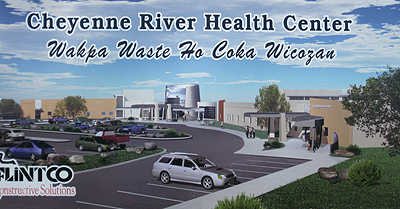 Another signage translation project was accomplished over the summer, this time for the new hospital being built in Eagle Butte on Cheyenne River. The “coining committee” used the LLC Lexical database to devise appropriate words and phrases for such places as “Counseling,” “Housekeeping,” “Hydrotherapy,” “Procedure Room,” “Ambulance Garage,” “Radiology,” and “Mammography.” More than 1200 words were needed. Like every language, Lakota has a variety of words for one kind of place, like a toilet, where usage depends on context and the individual speaker. The LLC team sought the most tasteful and representative words for each instance like this. LLC was brought onto this translation project by a Lakota language teacher, Dewey Bad Warrior, who teaches at Cheyenne-Eagle Butte Upper Elementary. Bad Warrior’s son, is a project coordinator for the hospital construction. LLC looks forward to touring the results of this project next summer! 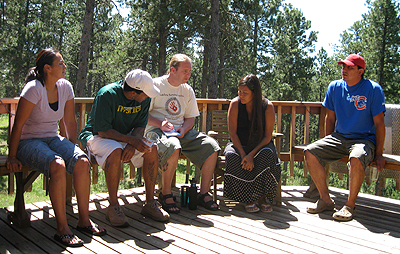 LLC tried something new this summer: a rental house in the Black Hills was the laboratory for an experimental four-day “clinic” of intensive Lakota language instruction and use in a home setting. Twelve adults participated as students with four instructors. The participants were either non-speakers or speakers wishing to build their fluency to a higher level. Instructors were Manny Iron Hawk, Ben Black Bear, Peter Hill, and Jan Ullrich. Although the clinic took place in a home setting, it was not designed as an immersion experience. English was used between participants, but instructors tried to use as much Lakota as possible. The weekend was free to the volunteer participants, and the instructors donated their time. Participants came from Pine Ridge , Standing Rock, and Cheyenne River. The Dakota Indian Foundation has given a green light to LLC’s envisioned documentary film on Lakota language revitalization. 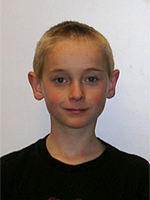 A DIF grant is funding the first stage of this long-term, four-year project. We hope to make a film that can re-write the public understanding of language loss and recovery, and make the language as vibrant for general audiences as it is for the Lakota. Part of our vision for the project is to find Lakota children and youth to follow for four years, to observe their personal journeys with learning the language. The first stage of production, already begun, involves filming Lakota families hoping to raise their children in the language. LLC will be searching for a well-known documentary director for the project. Áta čhó! 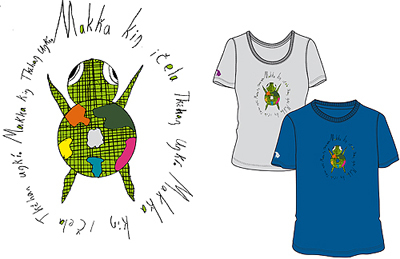 Two Standing Rock children speak Lakota to the world, as winners of a T-shirt design contest facilitated by LLC for Tatonka, a German outdoor adventure gear company that is also a committed sponsor of Tatanka Oyate Foundation, one of LLC’s partners in the effort to revitalize Lakota. Thirty Wakpala-Smee students from kindergarten to high school entered designs based on the Lakota proverb, Makȟá kiŋ ečéla tȟéhaŋ yaŋké. – “Only the Earth lasts forever.” The contest was conceived as a fun way to put Lakota words and wisdom into the public eye. The winning designs come from two 5th-graders at Wakpala-Smee Elementary: Thomas Miguel Thompson, first place, and Larissa Little Dog, second place. 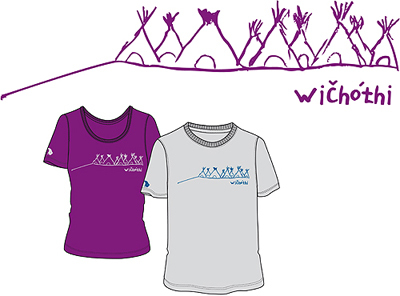 Larissa Little Dog is an 11-year-old from McLaughlin, SD, who says her favorite subjects at school are “reading and writing, but I like math the most.” Her second-place design is a cluster of tipis, with the word wičhóthi, “village,” underneath. Both students’ family members are involved with the Wakpala-Smee schools as staff, as well as supporting their children’s education. LLC congratulates the winners and all of the Wakpala-Smee students who entered their drawings. Terri Smith, the Lakota Language Teacher at Wakpala-Smee, says that for the past two years, Wakpala-Smee students have shown the highest test scores in Lakota language on Standing Rock. LLC is grateful to Terri Smith for her efforts to show Lakota children how to begin to find their own Lakota voice, and how that voice can be heard beyond the Plains. Both Thomas and Larissa will receive iPods from LLC as prizes. These winners and the other Wakpala-Smee entrants will receive free T-shirts from Tatonka which sponsored the contest. Starting next year, the winning T-shirts will be part of Tatonka’s Spring/Summer 2011 clothing line, available in the US through their online catalogue. Tatonka adopted the North American buffalo as their inspiration for excellence and fairness. The company is based in Dasing, Germany, and is considered the European equivalent of Patagonia in the US. Parents, teachers, pre-school instructors, and of course—kids—will be pleased to hear the long-awaited Educational Songs CD from the Lakota Language Consortium is now available. The CD features 15 classic children’s favorites such as: the Alphabet Song, BINGO, Days of the Week, Itsy Bitsy Spider, Twinkle Twinkle, and many more! Introducing a child to the sounds and rhythms of Lakota is an important step in making the language important and setting them on a solid path of discovering their their language. All songs are sung in Lakota by leading speakers. LLC scoured Lakota Country for the best singers and songs. With help from Ben Black Bear, Sandra Black Bear, Paulette High Elk, Verdelia American Horse, Wilmer Mesteth, Karen Little Wounded (LLC’s education coordinator) and LLC’s Jan Ullrich a great collection of favorite children’s songs has been put together. Accompanying these singers is Kevin Locke “The First to Arise” on flute. Kevin is a preeminent player of the Native American flute, a traditional storyteller, and a recording artist and educator well known for his hoop dance, The Hoop of Life. Since 1978, Kevin has traveled to over 80 countries to perform. He is frequently cited as an ambassador of Native American culture to the United States and the world. 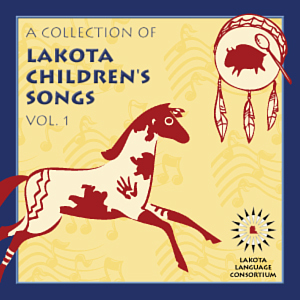 Order Your copy of the A Collection of Lakota Children's Songs Vol. 1 now!